Books...so many children books already and Greyson can't even read! We have books for ages 0 through to the teen years, yet we had nowhere to hold all of them. They literally just sat in reusable shopping bags tucked away in the corner of Grey's closet. Drove me nuts! I spent hours scouring the web for book storage solutions and didn't really come up with anything that I loved for a reasonable price, and then I remember a pin I saw once on Pinterest. 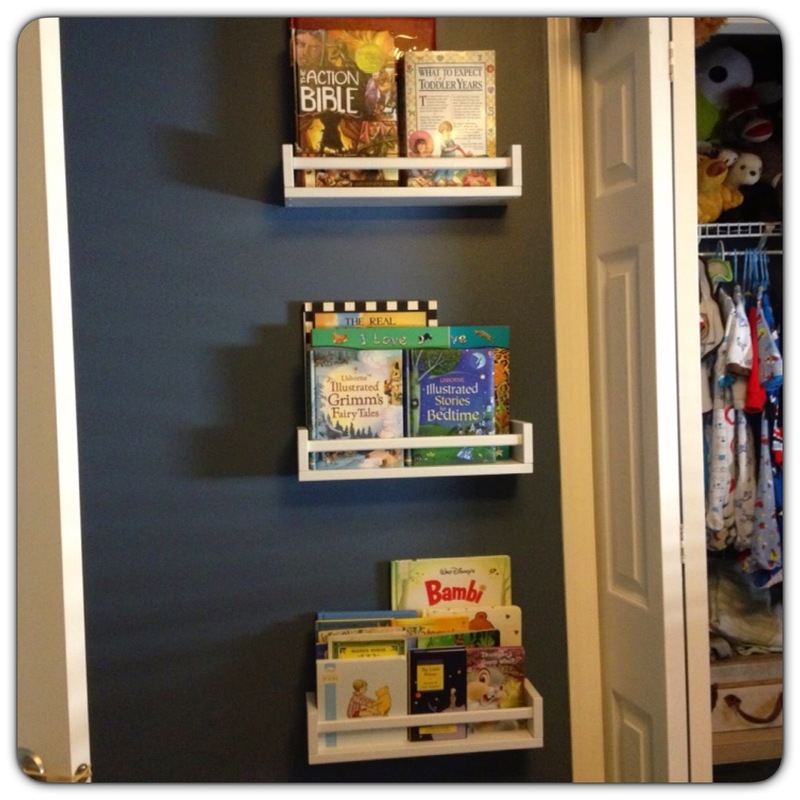 Ikea hacks...loves me some Ikea hacks! Don't know what an Ikea hack is? Google it! No seriously, you'll love it, it's taking an Ikea item and re-purposing/upgrading the item into something much cooler and customized to your tastes. Don't believe me? Those little book shelves are actually the Bekvam spice racks. Who knew an ordinary spice rack would make such a simple book shelf? The book shelf I was looking for ideally would have a little lip and rail to keep the books from tilting and falling off the shelf. Plus at $6.99 each, seemed like a steal of a deal to me. Here is what the spice rack looks like. Not much, but it's clean and simple and I like it. Of course the natural wood would not match the decor in Greyson's room so I whipped out my trusty spray paint and covered it in white, the same white I used on transforming my craft cabinets. Once painted and ready to hang, I decided to make my own template to make things easier, not only to make it easier to hang, but to figure out the placement of the shelves. All I did was tape together two sheets of paper (since the spice rack is 15" wide), put a spice rack on it and trace around, then stabbed a hole into the paper where it was on the spice rack. I wasn't sure if I wanted to stagger the shelves or keep them one on top of the other in a straight line, so making the templates and playing around with configurations was super easy...in the end, hubby and I liked just plain 'ol shelves in a straight line. Remember that hole I stabbed into the template? Once your template is hung, you know exactly where to put the screw into the wall! Since I would be placing books on the shelves and books get heavy (weird how paper gets oddly heavy, no? ), I used wall anchors as the screw placement missed the studs. After installing all the wall anchors and screws, I popped the shelves on and filled them with books!